Jasmin Stowers hasn’t been around forever; it only seems that way. Consider this: Jasmin had completed three years of varsity track, won three state 100H titles, placed fourth in a World Youth Championships, and witnessed her city of Pendleton SC proclaim August 17, 2007 as Jasmin Stowers Day – all before her sophomore year in high school. Yet at the same time, along with all of the South Carolina victories, and larger events at a certain level, there also seemed to be a long string of 2nd- and 3rd-place finishes in major meets, as the careers of slightly older stars like Jackie Coward played out at the same time. Several times those silver and bronze finishes were accompanied by 8th-, 9th-, and 10th-grade class (or age) records. 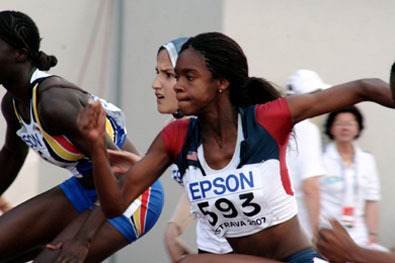 But those girls who beat her are gone, and Jasmin seems to have new life in her hurdling legs. The tall junior reigned over the field, literally and figuratively, at the Nike Indoor Nationals, slashing her 60H time down to 8.30 seconds – good for #4 all-time. She showed a championship style among the elites that exceeded anything previously. She’ll have one more year to chase the 55H and 60H standards, but now is the dawn of the first of two seasons left to move up the 100H list. Jasmin Stowers can forget about class records now and focus on being the best at the highest levels. With the April 10-11 Taco Bell meet in her home state next on her slate, she shared some thoughts with DyeStat senior editor SteveU. 1) Congrats on your season to date, especially the Nike Indoor title. Can you start by talking about how that race, or series of races, went for you that Sunday? What did it mean to you to get a national title like that and know you’ve ascended to the best in the country? Coming into the meet, I was very excited and nervous about running against the best in the nation. I knew I had to run fast in order to win Nike. I ran a good prelim race that morning, but I knew I had to improve my time in each race. Then I ran the semi finals. I was a little disappointed in my race because I had a terrible start and I had to catch up, but I ended up running a faster time than the prelims. Then, I started to prepare for the finals. I was tremendously nervous coming into the final race of my indoor season; I knew I had to run fast. When I got into the blocks, I was ready to run. Then all of a sudden, someone jumped the gun. This made me even more nervous. I knew I had to block that out and still get out first to the first hurdle. I got in the blocks again and the gun went off. I had a great start and was even with the other hurdlers in the race. Then I started to pull off and that’s when I knew I was going to win. I was over excited when I crossed the finish line. I was so happy. I knew I had to run fast. When I looked up at the board, I was shocked that I ran an 8.30. 2) You got a very early start with the hurdles and elite competition. Can you tell us about your start in the sport and what it took to get to the elite level in middle school? Were there other sports in your background? Did you gravitate to the hurdles right away, or did you spend more time at sprints or jumps first? I started to run track at the age of about 8 or 9 years old for my summer track team. At that time, I was running only sprint events. By the age of 11, my coach decided to put me in the hurdles. That year, I made it to the Junior Olympics in the 80-meter hurdles and placed 8th. My coach was overwhelmed by the fact that I could run the hurdles and make it to the nationals my first year. By middle school, I was one of the tops in the nation. At that time I didn't understand how big that was because I just enjoyed running and competing with others. I also played other sports, like softball and basketball growing up, but I knew running hurdles was what I was supposed to do. 3) Please tell us a little about your school, community and club? How does it all work together, in terms of coaching and workouts? I know a lot of athletes who run with clubs, like you do with Quick Striders, find it complex to work things out to be able to be train with a club, but compete with your high school at certain meets. I attend Pendleton High School in Pendleton, South Carolina. It is a great school. Since it is considered a small school, everyone gets along very well. The town of Pendleton is very supportive and perceptive. I am fortunate to run with the Quickstriders Track Club in South Carolina. My high school coach allows me to practice with my summer track coach and compete in necessary meets. 4) It seems like I heard that Pendleton gave you a “Jasmin Stowers” day a few years ago, after you got back from the World Youth meet. That must have been pretty amazing for someone not even in 10th grade yet. What are your memories of that now, and what kind of meaning does it have for you today? Yes, on August 17th, 2007, the town of Pendleton gave me my own day for participating in the World Youth meet in Ostrava, Czech Republic. I was very excited because I didn't think that could ever happen. I remember receiving the key to the city and accepting my award. Looking back at that day, having my own day was a very special moment in my life. Not that many people can say they had their own day. I was very thankful for that opportunity. 5) Speaking of World Youths, you’ve had an opportunity to compete in a few meets outside of the USA at a pretty young age. What are some of your best memories of those meets, including off the track, and what are some things you learned that you carry with you still today? Traveling across the world to run track is wonderful. Going to Ostrava to compete against the best in the world was awesome. I met new people, not only from the U.S, but people from everywhere. To me, it was like the miniature Olympics. We were treated like we were the best. I had the opportunity to see other cultures and appreciate my country, because everyone isn't as fortunate as the United States. It made me realize how lucky I was running for the United States. 6) In the last three years, it seems like you were an exceptional hurdler that wound up with a lot of runner-up spots because of older girls like Jackie Coward ahead of you. I know you beat Jackie at least once (indoors?) and am wondering what it was like competing with girls like her for those years. I mean, did it get frustrating at all, or were there a lot of things you learned from it? It seems like so far, during indoor at least, you’ve seemed enpowered to take it up a notch, especially with that 8.30 at NON? Is that the case? For the past few years, running against Jackie Coward didn't really bother me. I was always looking forward to running against her because it always made me better. Seeing Jackie and other highly talented girls run inspired me. To beat her once was pretty exciting because she was the best of the best. This made me realize that I had the potential to be the best like her one day. When I ran an 8:30 at Nike Indoor, I really couldn't believe it because Jackie only ran a 8.32 last year at Nike. 7) You’ve got a season of outdoor ahead of you, then a whole senior year … still lots of opportunities, even with all the experience you already have, to win titles and possibly set records. What are you finding is most important to you at this point? What are the championships and times you’d most like to get? Are you more motivated than ever now … and is that something that’s come easily, or only with some deep thought? This outdoor season, I want to become a more competitive athlete. It’s be important for me to win Nike Outdoor and compete at the biggest meets in the nation. This year for the 100 hurdles, I would like to run at least a 13.3. This would take a lot of hard work and dedication. I'm most definitely more motivated than ever to run at an elite level this year. Since Jackie Coward is gone, this motivates me to go out on the track and try to beat her records and times. 8) What are the things, in terms of speed, form, technique, etc., that you feel you can most improve in if you are to be able to approach the national record and win titles? In order for me to approach the national records and titles, I must always work on my speed in between each hurdle. I have to work on my start and make sure that I am the first person to the first hurdle. My technique must also be perfect over each hurdle in order for me to win at a national time. I have to become more aggressive and work on my abdominal muscles so I can have a strong finish. 9) Finally, what are some of your other interests beyond track? What intrigues you in school and what do you like to do most when you get some freedom from studying and the track? Any unique hobbies or interests? Other than track, I like to go to church and hang with my friends and family. In school, my favorite subject is math and science, because I love solving problems and figuring out new interesting facts about nature. When I have free time, all I want to do is relax. Running track and studying for school can be very stressful and tiring, so I try my best to get as much rest as possible.